There will be no more services at Mary Help of Christians Church come September, according to pastor Kevin Nelan. The announcement, made after mass today, seems to confirm rumors that the sale of the church, as well as the adjacent school building and parking lot, will be finalized next month. Mr. Nelan said the church, which was consecrated in February of 1918 and most recently served as a filming location for HBO’s “Boardwalk Empire,” would hold its last service on Sept. 9. 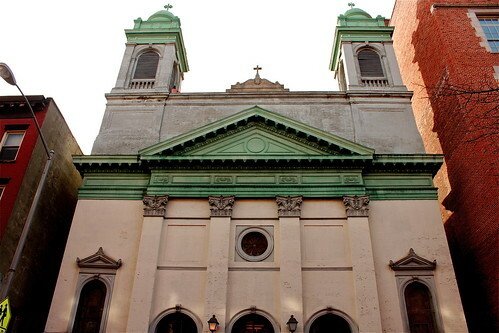 A week after that, Spanish-speaking churchgoers can attend mass at a “temporary home” at Immaculate Conception Church, on East 14th Street and First Avenue. The Immaculate Conception parish has been overseeing Mary Help of Christians church since 2007. Gloria Collazo, a neighborhood resident, said she had been attending Mary Help of Christians for 50 years. Her children studied at the shuttered school and her daughter was married at the church. On Friday, a representative of the Archdiocese of New York and a clerk at the Immaculate Conception Church said the sale of Mary Help of Christians had not yet been finalized. Though rumors have swirled, the property’s potential new owner has not yet been named. But vendors at the flea market in the church’s parking lot are already preparing to fold up their tables for good next month. On Tuesday, as he led The Local’s tour of Allen Ginsberg’s longtime apartment across from Mary Help of Christians, the poet’s former assistant, Bob Rosenthal, recalled a time when Ginsberg lived above the church’s bell ringer. The poet, who read and wrote till the early hours, would hear Mr. Buongiorno wake up at dawn, cross 12th Street, and ring the church bells at 6 a.m. These days, those bells are rarely heard.